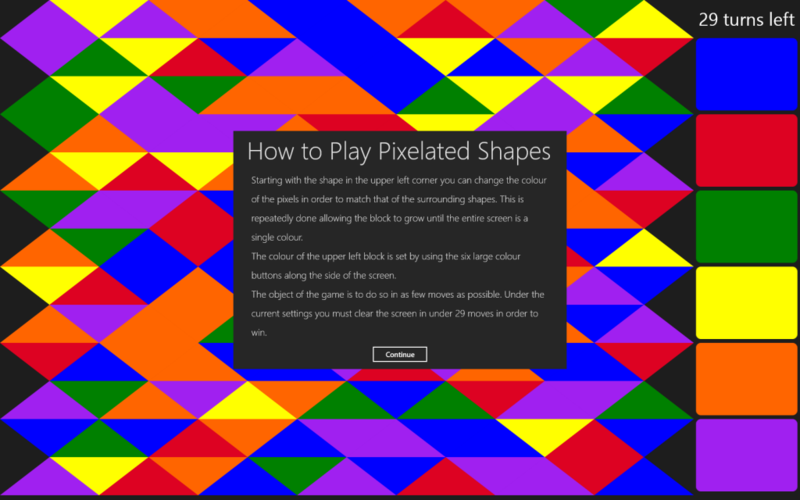 Pixelated Shapes has now been released for Windows 8 tablets. Pixelated Shapes is an addictive game of strategy and colour that takes the traditional Pixelated concept into new shapes such as Triangles and Hexagons. This version of the game includes all of the same features of the BlackBerry and Android versions of the app. Pixelated Shapes is a twist on the classic version of Pixelated that replaces the familiar squares with triangles and hexagons. 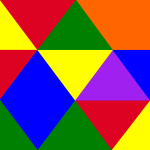 The object of the game is to get the screen a single color by slowly growing a blob out of the upper left hand corner by matching it to the colors of the surrounding shapes. This is done repeatedly until either the game is won, or you run out of moves. Under the default settings you must clear the screen in 29 moves or less in order to win. A one time in-app upgrade can allow you to adjust the difficult, switch color schemes, change to different game modes, and get an indicator giving you the number of remaining moves.